Trying to find the perfect present? 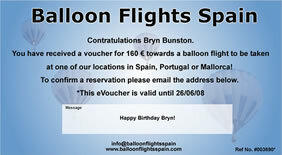 Why not give a gift voucher as a present for a balloon ride to somebody living or visiting Spain, Portugal or Palma Mallorca, Majorca? Or as an ideal gift or incentive to corporate clients, or as part of a corporate entertainment package. We provide balloon rides all over Spain, Portugal or Mallorca. New this year is our "eVoucher" this can be sent to a person of your choice with your message printed on the voucher, you can give as little as 25 euros towards a hot air balloon flight. *Please not that a balloon ride normally costs 160 euros per person, so if you are planning to give a complete flight as a gift please select the relevant amount.